Description: An effervescence of illumination shines brilliantly through this dazzling, exquisite column bracelet chandelier which was inspired by a Rhododendron bush. 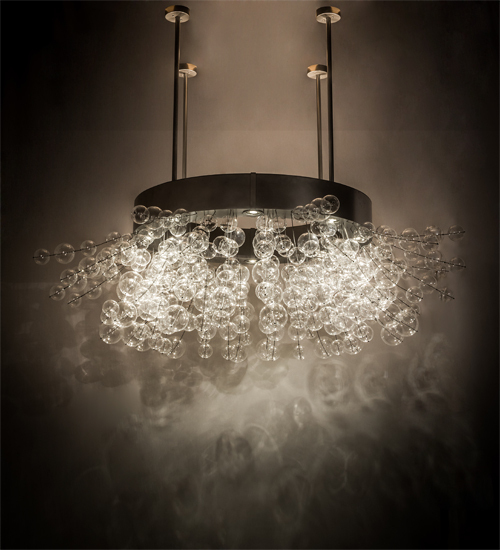 Perfect for installation around a large column, this grand-styled 90-inch fixture highlights dozens of Clear Glass orbed accents. The orbs illuminate with 8 customer supplied, Medium based LED 12-watt downlights and extend out with branch-like rods embraced by the sturdy Nickel-finished ring. 8 Additional 5W LED lamps provide ambient uplighting. Handcrafted in our 180,000 square foot manufacturing facility in Yorkville, New York. This fixture is available in custom sizes, styles and finishes, as well as dimmable lamping options. UL and cUL listed for dry and damp locations.